We regularly get asked about the gear we choose to use, and we’re here to answer that question. Since we live on the road and our space is limited, our gear volume fluctuates depending on the season. And as we end up testing a fair bit of gear, it can rapidly increase or decrease in size. This photo shows most of the gear we carry on a regular basis, excluding any duplicates (and of course ropes, slings, chalk bags, etc …). We wanted to dive into why this is the gear we are currently using, what we like, and what we don’t – and there is definitely some of it we don’t like. Below you’ll find more details about our 4 helmets, 10 different belay devices, and a seemingly unhealthy number of lockers. Currently, we “only” carry 4 different climbing helmet styles with us (we do also have 3 ski helmets and 2 bike helmets). Petzl Sirocco – This latest version (2017 onwards) looks really good; it sits low on the head and the black is a great improvement from the 2016 orange version. We recently acquired our pair of Sirocco’s at a Petzl event and are blown away by how light they are. They will definitely be traveling with us long into the future (until they’re inevitably destroyed; they are fragile, and we are not particularly delicate). 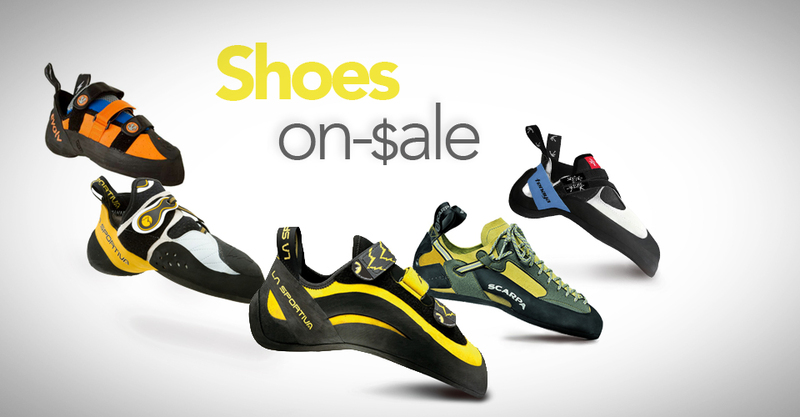 We haven’t testing them during summer climbing yet, so I’m not sure how much heat the black will attract. It’s the lightest helmet on the market, but you pay for the weight savings, at $130. Black Diamond Vapor – This has been my go-to helmet up until we got the Sirocco. Now, I foresee rotating between the Vapor and Sirocco. I’ve been using the Vapor for at least 4 years, and although it is definitely fragile, and it has scuff marks just from hanging out with gear, and dings from my lack of awareness while climbing, overall it’s held up better than I originally feared. It looks pro and the weight is barely noticeable. As the second lightest helmet on the market it also commands a high retail price, $140. Black Diamond Vector – This and a (not shown) Singing Rock Penta* have been Andreas’ go-to helmets for at few years now. The Vector rides slightly higher on the head than the Vapor — so style-wise we both like the Vapor more, but is it isn’t really noticeable while on your head–just in photos afterwards. We typically choose white if there is an option since it doesn’t absorb heat. It’s now tied for the 11th lightest helmet, and it’s much more reasonable in price at $99. Grivel Stealth – We definitely like the white and gray color options in addition to the geometric styling of this helmet. Unfortunately it’s seems a little big for our heads (it has wide sides). The webbing strapping system fits great and is easy to adjust, so it’s safe, but it only comes in 1 size and we both have small heads. For those of you who have larger heads this helmet could be an especially sweet option. It is a really great deal at $99 as the 3rd lightest helmet on the market. *Singing Rock Penta (not shown)- Recently loaned out to a friend, this is one of the best deals on the market as helmets go. Incredibly lightweight and very reasonably priced – it’s the 6th lightest helmet and only $70 retail. The webbing strapping system works flawlessly and it just feels and looks good, in our opinion. In our storage unit we still have some hard shell helmets, but since we get most of our helmets for a big discount (or free for testing), we choose to buy these lighter, less durable helmets. And, even though we haven’t used one yet, the Mammut Wall Rider seems like a fantastic option in terms of lightness plus a bit more durability (4th lightest, $99). We haven’t cleaned out our “gear closet” lately, which actually consists of a plastic storage tub and Patagonia duffel, so the gear has been adding up. 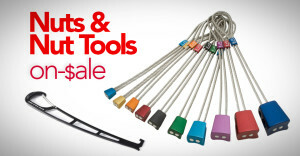 It turns out we’re currently carrying 10 different styles of belay devices. And yes, it’s true, we don’t actually own a GriGri 2, weird, I know. In order, top to bottom, left to right. DMM Pivot – Our newest addition! I have been so curious about this device that Andreas just bought it for me for Christmas. Vermont’s weather hasn’t been conducive to climbing lately, thus the shiney glimmer. SMC Spire – We were sent a prototype of this device and started testing it at the same time that we were trying to “finish up” some old ropes so we could retire them. The Spire didn’t like our well-used 9.8mm (not to mention the 10.2mm! ), and we had to really work to stuff them in, so we stopped using the Spire for awhile. It’s super lightweight and the rotation in guide-mode is a smart design so it’ll stay with us in our gear bin for when the time is right — it’s the lightest guide-mode device on the market, a few grams less than the Reverso 4, and has additional functionality! Edelrid Mega Jul – We love this device. In the last 3 years it has received the most use of any device here, by far. It’s definitely not as smooth for lowering or bringing up a second compared to other devices, but it just feels so much safer, especially when you’re tired or climbing/rappelling in the dark (which was very common when we were climbing in El Potrero Chico last winter season). Petzl Reverso – They’ve continued to hollow out the sides since I got mine, so I can’t speak to the current generation’s durability. My generation is a dream on alpine climbs: super smooth handling, durable, and on the lighter side of the guide mode options. Bonus points for the back guide mode hole that is perpendicular to the rope slots, not an easy feat to produce! Edelrid Mega Jul Sport – We don’t actually use it much since we prefer to have the guide-mode functionality of the Mega Jul. It does have smoother handling than the Mega Jul though, which is nice for single pitch climbs. Edelrid Jul² – We really like the durability as it’s made of steel. We use it for sport cragging when we’re lowering and not rapping off climbs, which isn’t actually that often for us. Mad Rock Lifeguard – The smallest mechanical brake assist device it easily fits in the palm of the hand. We used it a lot while testing and enjoyed belaying a leader. But it doesn’t work well to bring up a second while belaying at an anchor because it takes longer to grab the slack, so you end up re-pulling a bunch of rope. It’s less-ideal for us since we prefer multi-pitch. Black Diamond ATC – This never goes out with us, since it doesn’t have guide mode or teeth or auto-locking capabilities. 6 years ago, when I just owned the Petzl Reverso I decided to keep it around as a backup device in case I lost my 1 main option… it seems to have hidden itself in the gear bin even as we accrued many other more featured devices. Anybody want it? Trango Vergo – This is a really nice belaying experience! It doesn’t take long to figure out the nuances of grip and paying out slack. The handle actually gives a gradual lower that is much nicer than the GriGri 2 (we don’t own one, sure, but we’ve definitely used them!). Why in the #*@! do we have so many lockers when we only take 2 or 3 on a climb? Good question. I think it’s because manufacturers offer them to us. But, we actually purchased many of these in an everlasting search for the ideal gear. Note: This selection also does not show any duplicates we own. For some reason, we rarely cull down our stash of locking carabiners. Somehow it just seems wrong to get rid of a locker. The only time they’ve left us is when they get lost, loaned forever, or are used to beef up a sketchy anchor. But really, we should donate most of them. Instead of talking about each one, I’ll dive into our most-used and the most-curious. Edelrid Pure Slider – Our most used carabiner style. We love using this guy for anchors and personal tie-in points. It always comes with us. We lent Tommy Caldwell one while climbing in Italy, and we never got it back. We haven’t forgotten, Tommy. We liked using this to belay for a lightweight setup, but many of the autolocking devices (ie, Edelrid Jul-series, Mammut Smart, BD Pilot, etc) won’t engage with a small D, so we always use an HMS now, just to make sure we’re in a good habit. Edelrid HMS Strike Slider – Andreas uses this guy as his belay carabiner. We also both love to use these for anchor powerpoints. It’s tied for our most used carabiner style along with the Pure Slider. Edelrid HMS Strike Slider FG – Often I’ll use this one for belaying. I tell myself that the time it takes to put in the belay keeper is totally worth the lack of cross-loading. I use this one no matter which belay device I’m using. Black Diamond Vaporlock Magnetron – Andreas will use this if I’ve stolen all the Edelrid Sliders. Before the Slider’s entered our lives, it was always what Andreas would use for his personal anchor. It fit’s his bigger hands better than mine (Men M vs Women S). Grivel Tau – This is by far the easiest to open of all the Grivel twin locking carabiners. It’s an interesting concept and easier to get off the harness than the other twin gate styles. It also has a nice, more square-like bottom that holds a belay loop or dogbone well. Also, at $15 retail it’s one of the cheapest auto-locking options. Grivel Plume K3G – The second nicest Grivel twin lock carabiner style. It’s easy to open since you can stick a finger in between the gates and then it’s not much pressure to finish opening. Only downside: The wire gates are a little wide, so it won’t fit though all chains/anchor styles — but it does fit fine through bolts. Until writing this post I didn’t realize that all our favorite styles were auto-lockers. I guess we just like the safety — and speed. Each of the carabiners described above are a lot faster to open than a traditional screw-lock and they instantly stay shut too. Win-Win. Note: We don’t recommend climbing with all different carabiners, and we rarely do. This is just a picture of all our different carabiners options. We keep some around just for holding things, or as a comparison of good/bad, or refreshing our memory on what’s possible. Note: The only thing worse than climbing on a different array of carabiners, is climbing on different quickdraws! Often when we get draws to test we get 2-5 of them. So, at times our rack is a pretty wonky. If we’re climbing for pure fun, and aren’t testing, we often take a select group of the same (or most similar) draws. Or we’re using alpine draws, of which none are pictured. Wondering about other gear in the photos? Ask in the comments! This Gear Stash post is Part 1 of 11 and is sponsored by Backcountry. This means, all opinions are 100% the author’s and there has been no manipulation of the gear being displayed, but gear links go directly to Backcountry’s website when available. This sponsorship helps to keep WeighMyRack alive, to pay authors, and allows more articles to be written. 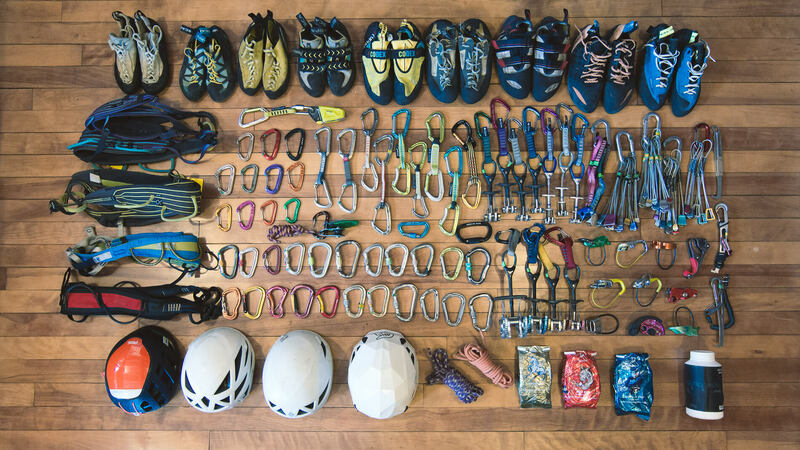 Also, since Backcountry has the biggest online selections of climbing gear of any US retailer, it made sense for us to partner with them for our Gear Stash stories. Wondering why you guys need so much different Carabiners on ur rack?! I’m personally using some Petzl Attache 3d, they are simple, beautiful and light enough for me. This is my go to carabiner. I’ve had some others like BD gridlock but I ended up finding them bigger and less easy to use because of the “position locking” design. Anyway the simpler the better I think. Looking forward for the new next episodes of this serie. Yes! This is a great point Quentin. Partly we have a lot of gear because we’re always testing new gear, and part of the big assortment is for comparison. Like, if we’re reviewing a product, how does it compare to other similar models. When we were starting out, it also took awhile to understand gear, so we kept looking for what options are best. We definitely agree, simple is better. It’s just hard to be simple when you’re always testing!